It’s beautiful, really — but like the game itself is rough around the edges (just look at the recent ejection of a pitcher for “hiding” pine tar on his neck). But, bear with me, let’s see how this metaphor plays out. On to Second Base = Connections & Communication. We were often asked in our case studies to address the question “What’s moving in the network? How are nodes situated? Describe the nature and directions of the relationships formed.” Again and again, we reshuffled the roster, trying out new combinations, looking for that “sweet spot” of theory to create a FrankenTheory that captured the complexity of our objects of study (dare I say, a pennant?). One of our final readings this term was concerned with Operating Systems, which — come to think of it — captures agency, nodes, movement, and signals for so many of the theorists and readings we covered. So, take a base. Third Base = Meaning & Knowledge … nearly home. Our network theories always already involved knowledge. Whether it was in terms of creating or distributing, all of our theorists and practitioners (ourselves included) touched this base. You may notice I repeated a node here — the OS makes another appearance. Those kinship patterns — cultural discourse, ways of knowing, ways of learning — have to be embedded here, as well as back at 2nd base. And, wouldn’t you know it, 1st base as well. That’s the power of an ecological system — there’s material transfer happening all over the place. 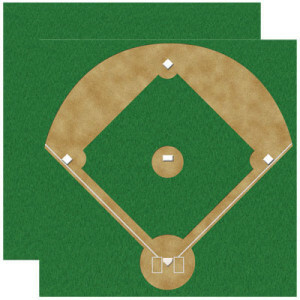 At last, Home Plate = Why theory? It’s why we came to the park in the first place. I saw this as both the goal of the course, but a destination too. It’s where I locate myself as a scholar, and a practitioner. And true to any baseball game, it isn’t just the bases that matter. It isn’t even the players. We can’t complete this mindmap without widening the reach of this network to include those fans, the “10th man.” This is where we write our Case Studies, add new theoretical layers, toss out uncooperative ones. This is where we find the ecology of our field, where the game really becomes interesting. Extra innings? Double header? Maybe next time. Right now, I think it’s time for the 7th inning stretch.